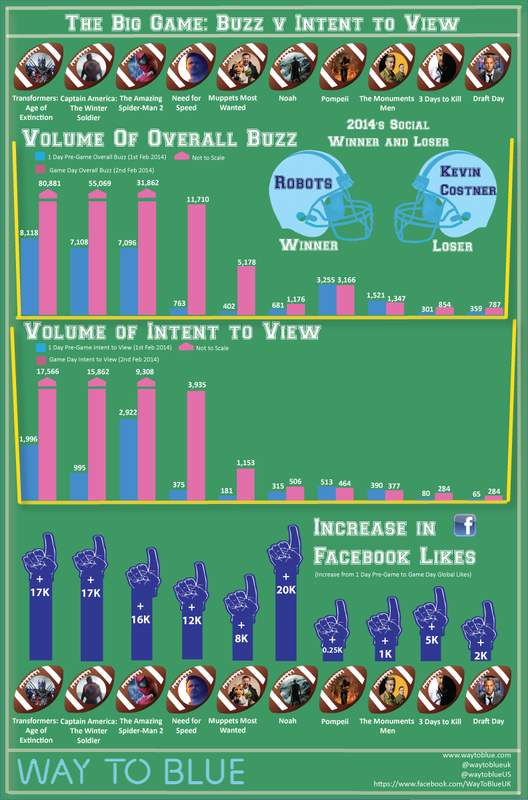 Last night the Seahawks may have flown away with victory defeating the Broncos but an equally interesting battle was being waged during the commercial breaks and on social networks. Transformers: Age of Extinction crushed the competition both in terms of post-game chatter, and most importantly Intent to View. This means that more people have expressed a desire to see Transformers: Age of Extinction than any other movie, following the advertising spot during the big game. The fact the trailer wasn’t released until after broadcast will have impacted this, much like Fast and Furious 6 did in 2013. Other Intent to View and buzz volume winners were Captain America: The Winter Solider and The Amazing Spiderman 2. Special attention must be drawn to Need For Speed. With the field left wide open for a car orientated movie this year, the film scored a touchdown, seeing a massive uplift in terms of Intent to View and Buzz volume after it’s TV spot aired during the Super Bowl. Movie pages on Facebook also saw an uplift in fans post Super Bowl as well, with Noah scoring a 20K increase in likes after it’s spot aired during the Super Bowl. This is despite the spot pre-releasing earlier in the week. It’s also worth highlighting that Robocop, despite not airing during the game itself trailed the film’s release in the pre-game warm up, saving vital dollars in terms of marketing spend. However its Facebook page still saw a large spike in likes adding almost 20.5K likes after the spot aired. The Way To Blue ‘Intent To View’ algorithm is based on a combination of social conversation search queries combined with proprietary methodology developed over numerous studies into the film and entertainment Industry. Way To Blue is a global integrated communications agency, delivering insight led strategy and creativity for clients across the film, entertainment and retail industries. Kick Off the Year of the Dragon with “Dragons: Defenders of Berk Part 1” on DVD March 25! So the new Transformers movie trailer has come out, and the internet commentariat has already unsheathed their claws. Comments range from “raped my childhood” to “I really don’t like that Michael Bay guy.” And yet, the Super Bowl spot with the big robot dudes may have done exactly what Bay and company wanted, generating more buzz than any movie trailer showed during the game. You’re doing the Lord’s work, internet.